Arginine, a semi-essential amino acid, has been studied extensively for many years as a protective agent against cardiovascular disease. It stimulates production of nitric oxide (NO), a substance that helps relax the smooth muscle cells in blood vessels and thus promotes dilation of arterial vessels. 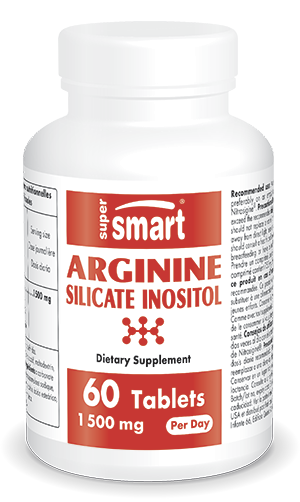 The supplement Arginine Silicate Inositol offers the benefits of a particular form of arginine - one of the 20 amino acids essential for human health. In this patented complex, it is combined with silicon, a compound known for its protective effects in the body. The combination in Arginine Silicate Inositol offers a number of health benefits, particularly for the cardiovascular system. Arginine is an amino acid which is involved in many of the body’s metabolic processes. It supports protein synthesis such as creatine, known for its role in muscle activity. It also helps stimulate production of human growth hormone (HGH) which burns fat to produce cellular energy. Arginine offers other benefits too, promoting wound-healing, improving erectile dysfunction and protecting the cardiovascular system. Widely-studied in recent years, arginine is now considered a precursor of ‘endothelium-derived relaxing factor’, which means it is able to stimulate production of nitric oxide. This compound plays a role in arterial elasticity and causes the smooth muscle in vessel walls to relax. Arginine thus offers beneficial vasodilatory properties for preventing and treating hypertension. The complex Arginine Silicate Inositol has the advantage of containing silicon, a compound which plays a protective role in connective tissue including that of the blood vessels. Silicon acts by strengthening and improving the flexibility of artery walls, which helps promote and increase blood flow. Silicon, like arginine, thus offers benefits against hypertension. Combining the cardiovascular benefits of arginine and silicon, the complex Arginine Silicate Inositol has proved particularly effective at combatting hypertension. Researchers have demonstrated several blood pressure-lowering effects including increases in nitric oxide levels, improvements in blood flow, and significant relaxation of blood vessels. With its therapeutic benefits, Arginine Silicate Inositol is particularly indicated for those suffering from, or at risk of, hypertension. Arginine supplementation is also recommended for correcting any shortfall in arginine or for treating actual deficiency. Supplementing with arginine is very popular with sportspeople keen to boost their muscle activity. Arginine Silicate Inositol is a high-quality supplement, its bioavailability confirmed by several studies. The recommended dose of this optimally-formulated, state-of-the-art arginine supplement is one capsule, once or twice a day, though this dose can be adapted to your needs and the advice of your therapist. Other arginine supplements are also available from our catalogue: Acetyl L-Carnitine Arginate, the specific form Arginine Alpha Ketoglutarate or the arginine precursor L-Citrulline. Other ingredients : calcium carbonate, dicalcium phosphate, stearic acid, microcrystalline cellulose, magnesium stearate, sodium croscarmellose, silicon dioxide, pharmaceutical glaze. Nitrosigine®, Nutrition 21, LLC, USA.